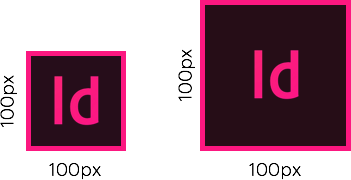 Once upon a time, back in the days of InDesign CS4 and earlier, viewing an image at 100% meant that each pixel in an image took up one pixel on your monitor. So a 50 pixel square viewed at 100% would appear the exact same size in InDesign as it did in Photoshop. It was fancy! But those days are gone. Go to InDesign, create a new document using their 800 x 600 pixel default, take a screenshot and measure. On my 27″ iMac, that 800 x 600 document is actually 1210 x 908 pixels when viewed at 100%. So what gives? Adobe changed the default screen resolution from a strict 72 ppi because monitor resolutions were getting higher as technology improved. If you were working on a print project, an object that was 1 inch wide in your document used to physically measure around 1 inch on your old CRT screen. But as resolutions increased and the world switched to LCDs, that inch kept getting optically smaller. I’m guessing this made some print designers unhappy, though it never bothered me. If you still work solely on print projects you probably don’t care about any of this. In fact maybe you love what Adobe has done. Double-click on that new script you added and BAM! … nothing happens. Ok, just wait a sec. Now double click on the zoom tool in the tools panel (you know, the magnifying glass under the hand) … and now BAM! The document should have just gotten smaller because now a pixel is a pixel — just like the days of yore! Call that one something like ‘Monitor resolution – default.js’. Now you can switch back and forth using the scripts panel.